Nowadays almost every successful website features a slider on the top of their homepage. This makes it hard to imagine a website without a slider. Luckily, sliders can be used on a lot of websites. Most often you can see sliders on business or portfolio websites, as that’s where they shine best. You can highlight your content and visualize it in an interactive slideshow. And sliders can help you draw your visitors’ attention. But how can you create a slider? Do you have to know how to code? People think that they can’t create sliders and beautiful effects unless they learn advanced coding. But this isn’t true, everyone can create a slider and use a slider builder tool. A good and modern slider is very user-friendly and contains every option a user needs. It is even easier if you use WordPress, because there are many slider plugins available. For instance, there is Smart Slider 3 plugin which you can use to create your own slider with ease. Haven’t you heard about that? No problem, in this article I would like to introduce you Smart Slider 3. 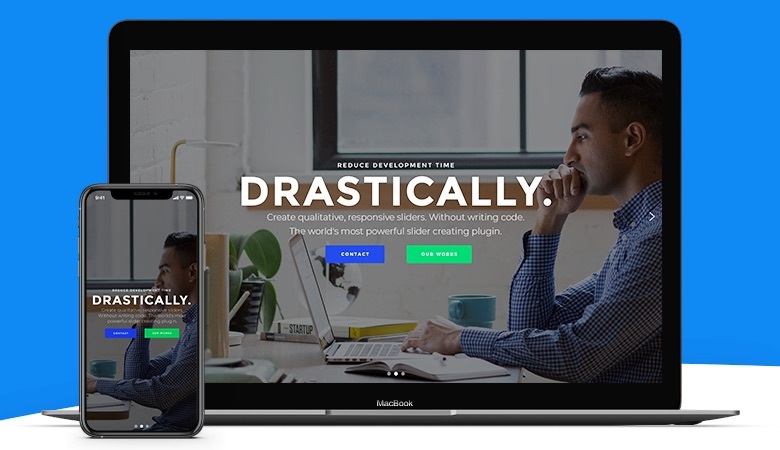 Smart Slider 3 is the best-rated slider plugin in WordPress with more than 500 reviews and 5/5 Star ratings and with 300,000+ active installations which is an incredible achievement. Smart Slider 3 is available for free, but has a pro version as well with more features and functionalities. You can create a simple image slider or a hero slider with text, buttons, and effects like Ken burns and Parallax, but you have an opportunity to use shape dividers and particle effects as well. Furthermore, you can autoplay the slider and animate them in the pro version. Besides that there are many navigation elements what you can choose from, like arrows and bullets, and these are fully customizable. So making a slider only depends on your imagination. Smart Slider 3 has a visual editor that allows you to design each slide. You have the freedom to build whatever you want, you can edit your slides with drag and drop, and you may structure them with rows and columns. You can customize your texts, like changing their size or color and you can use your favorite family as well. So you can manipulate your content in your slides to look exactly how you have imagined it. In Smart Slider 3 there is a live preview option that allows you to see every change you make in real time without having to save it. For example, you update a picture and add a text layer to your slide, you can click to the Preview and you can see the changes how it looks like with your other layers, and you can check it in mobile and tablet view as well. In Smart Slider 3 you can choose from several layers. The most popular layers are the heading, text, button and the image layer, but you can put a YouTube and Vimeo video on your slider. In addition, the plugin is user-friendly. You can easily add layers to your slides, and with drag and drop, put them to your slide. The whole process is very easy and intuitive. Each layer is fully customizable and has a lot of settings. You can change the font color, family, the font-size, the padding, the borders – so everything. You can even set for example the tag at the heading layer, which means you can use h1 to h6 or div. And this option is good for SEO because with that you can better structure your content. And what is also important that Smart Slider 3 is SEO friendly and every text you write is perfect for SEO and search engines. At image layers you can add a SEO alt tag and title as well, so using a slider in your site can be just a good choice in my opinion. In Smart Slider 3 Pro you can choose from more than 20 layers. One of my favorite ones is the new Highlighted heading layer, by which you can put the focus on the important part of your headlines with a highlight. And there are a lot of animations available which you can choose from and these are fully customizable. In Smart Slider 3 there are 2 editing modes, the Content and the Canvas mode. This is a very innovative solution because you can’t meet with this kind of solution in other slider plugins. Content mode works like a page builder, you can use columns and rows. This mode allows you to build your slide fast and with a clean design. It’s easy to use and it is fully responsive. For instance, if you create a 3 column layout, the slider puts them above each other in mobile view and the text will more readable. Also the font-size and the paddings can be changed on every device. When you use this mode, your slide’s height is based on the layers and all the slides’ height are based on your highest slide. So you can appear every content on every device and you can customize them. The other editing mode is the Canvas mode. In this mode, you have the option to put your layers anywhere in the canvas, and you can put them above or below one another. So you have total freedom to position your layers. This is the editing mode what all slider plugins offer. Smart Slider 3 has an option to hide layers, or hide the whole slider on different devices. What’s even more, you can display different sliders on different devices if you want. This can be useful for example at a slider where you use videos and a lot of animations, and you wouldn’t like to display it on mobile. Or if you don’t have the time or an idea how to make a slide, you can use the Slide Library. There are a ton of premade slides what you can use. You can browse and choose from over 100 templates. Furthermore, you can find different types of slides, including slides for headers, testimonials, products, and more. All you have to do is pick a template slide and customize it with your own content. You can import not just a demo Slide, in Smart Slider 3 there are a lot of ready to use sliders what you can use. You can customize every slider as you would like to, you can change the colors, structure, font-sizes and you can change everything else you want. What is more, by importing a demo slider you can not only save time, but you can learn from them. You can see all the settings, and if you want you can change them. If you create a new slider you can choose from 3 slider behaviors in the free version of Smart Slider 3: Default, Full width and Thumbnail type. Default: Default slider is the most typical type which you can encounter most often on the web. The default sliders have an auto width which means your slider will be as big as the container it’s in. Full width: With a full-width slider you can make a slider which will be as big as the screen width. Thumbnail: A Thumbnail type slider looks like a gallery with small thumbnail images, so you can make a slideshow with a preview of your slides. How to create a unique image slider in 2 minutes? Creating an image slider is very simple with Smart Slider 3. After you choose your images which you would like to show in a slideshow, you are done with your slider. In addition, you can turn on the autoplay, change the arrows, customize the text bar and the thumbnails. Where can you use your image slider? Almost everywhere. Being it just a simple blog or a portfolio website, but at a business or company website you can use it as well. In Smart Slider 3 there is an option to highlight your Posts with creating a dynamic slider. In this slider, you can put the most important information, for example, the Post title, date and featured image by which you can draw the attention of your visitors and make them read it. 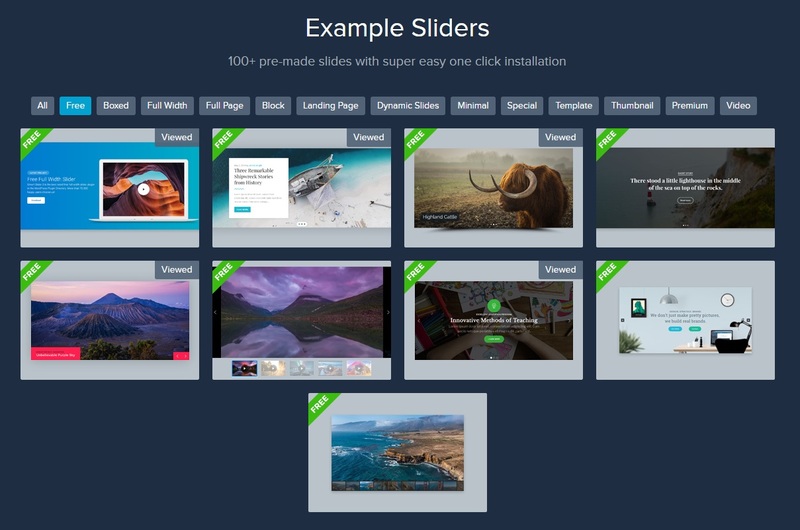 Dynamic post generators can create slides from your blog posts from the selected categories, and your slider automatically refreshes when you add a new post to your site. But generating a slider from your posts isn’t the end of the dynamic sliders’ functionalities and possibilities, in the pro version you can select from countless generators. For instance, if you have a WooCommerce webshop, with Smart Slider 3 you can create even a product slider. I think Smart Slider 3 is much more than a simple slider plugin. It can be a great tool for everyone for creating beautiful modern sliders for their web projects. By using layers you can use your slider for almost everything. The good thing is that you don’t have to take any risks. There is a free version available, it is enough just to download and install and you can begin creating super sliders. The free version has a lot of features as well but if you want more than that, you can buy Smart Slider 3 pro which has even more features.